Klaus Composites is growing and always looking for talented, driven, and passionate people to join the team. Follow the links below to read about our open positions. If you are up to the challenge and are ready to join us in our work to revolutionize the exciting and dynamic Composites industry, send your résumé and cover letter to [email protected] with the title of the position you are applying for in the email subject line, and we will be in touch! A paint and body technician is responsible for all aspects of paint and coating application on plugs, molds, and finished parts. 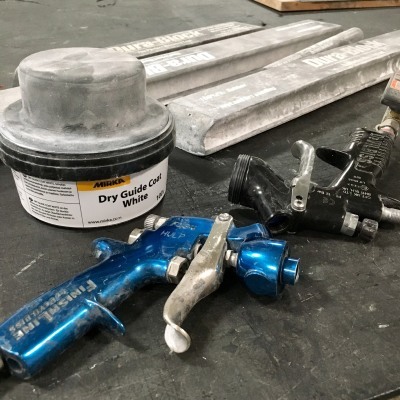 Candidates must be well-versed in bodywork techniques such as filler application, block sanding, priming, and automotive/aerospace paint and clear coat preparation, application, and refining techniques such as wet sanding and polishing. Full time position. We are seeking a driven, fastidious, and enthusiastic recruit to work as an assistant to our experienced laminators, participating in and overseeing the layup and assembly of advanced composite structures and systems. Opportunity, responsibility, and compensation grow with your experience.